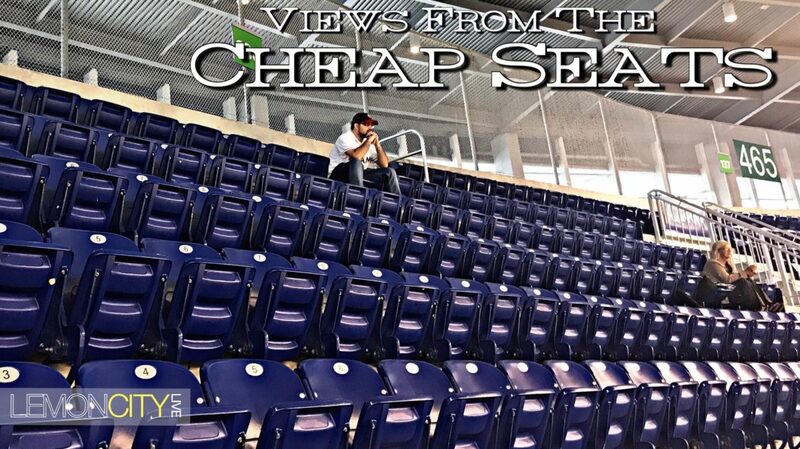 Hello and welcome to the latest, though abbreviated, edition of Views From the Cheap Seats! When we last encountered each other oh those many moons ago, I had hoped the Marlins could take care of business with Oakland. Boy did we. Though I have trouble thinking winning both contests of a short two-game series is really a sweep…I’ll take it. The Marlins throttled the Athletics 8-1 in the first faceoff with Giancarlo Stanton returning with a bang, absolutely smashing the ball into the stands as part of a four-run fifth. Wrist injury? What wrist injury? Marcell Ozuna also dinged one in the fourth to tie the game with Dee Gordon lining a single to help the Fish take a 2-1 lead. After that, we never looked back. José Ureña got into trouble in the top of the second committing a bases loaded balk but recovered nicely and not only got himself out of a jam but tossed 6 strong innings accumulating 4 strikeouts before allowing the pen to come in and finish the job. Tonight’s relief trio consisted of David Phelps, Jarlin García and A.J. Ramos. Ozuna finished the night going 3-for-3 while Tyler Moore was fantastic as well, hammering two doubles and going 3-for-4 with 2 RBIs. Together, our offense struck for 11 hits, 3 of them doubles and 2 homers while going 3-for-10 with runners in scoring position. On the following day, Oakland and the Marlins squared off one more time in an early afternoon game as Edinson Volquez looked for his fourth straight victory facing rookie starter Daniel Gossett making his major league debut. The hits kept on coming as the Marlins scored for six straight innings, amassing 11 runs on 13 hits. Both Gordon and Yelich went 2-for-4 adding two more RBIs to their season totals with Ozuna hitting yet another homer and seeing Moore power as the first basemen jacked his fifth homerun of the season. Stanton kept up the good work not missing a beat going 2-for-4 as well with a RBI. Volquez, however, was unable to secure his fourth straight W, lasting only 4 innings giving up 5 runs and walking 4. The revitalized bullpen took over and held the Athletics down for the rest of the game allowing one run in the ninth as the Marlins stood triumphant 11-6. A’s pitcher Gossett only lasted 3 and a third, allowing 7 runs, 6 of them earned, in a rough debut. Don’t worry kid, everybody has bad starts, just ask Volquez. This was the Marlins largest come from behind victory of the season. On a minor note, rookie Drew Steckenrider took to the hill in the final inning and while he did get into some minor trouble allowing a run, he gets the job done. The Marlins get another day of rest before heading out on the road for a 3 game set with Atlanta before returning back for another 10-game home stand with the Nationals, the Cubs and the Mets. A challenging slate indeed. Marcell Ozuna continues to build his pretty much undeniable case of being a part of this year’s All-Star Game and I really hope that not only do we get Ozuna there this year, since it’s in Miami, but also the lineup has at minimum 5 Marlins selected. Lofty? One can hope at least. He went 3-for-3 and 2-for-5 scoring 2 homers totaling 17 on the year as well as 4 RBIs in the series. Fact: Ozo & G have homered in the same game FIVE times this year. Stanton wiped away any concerns, smashing in a 398-foot shot Tuesday night with me in attendance as well as going 2-for-4 the next day contributing to the victory. Tyler Moore continues to amaze as he went 3-for-4 Tuesday with two doubles and just as many RBIs while hitting his fifth homer of the season off the rookie Gossett as part of the rally to tie and ultimately win the game. Justin Bour is expected to come off the 10-day disabled list Friday, the first day he is eligible, and I’m starting to wonder. Is there any place we can keep Moore? The guy has been hitting pretty damn swell, doing an excellent job filling in. He’s played in the outfield before but you can’t remove Yelich, Ozuna or Stanton least you’re giving them a day off. And when that happens its Suzuki that can get the nod. I’m drawing a blank on what can be done, Bour is still way up there in Homeruns with the rest of the league along with Stanton and Ozuna. All I can do is tip my hat to the guy and know that if we need someone to step up, we will see Moore. Until next we meet, stay frosty my friends. Stat of the “Week”: 2-for-64. I assure you this is not the batting statistics of any Marlin. It is however what Oakland pitchers have been able to achieve in the past 4 seasons. That second hit was all thanks to the rookie Daniel Gossett, an infield swing in the fourth. The Lemon Drop – O Captain! My Captain!